My main field rigs, an Elecraft KX3 and an Elecraft K2, both with built-in antenna tuners, are all-band MF/HF rigs, covering 160m through 10m. (The KX3 also covers 6m.) It is my goal to find an easy-to-deploy yet effective 80-10m antenna for use during my field operations. 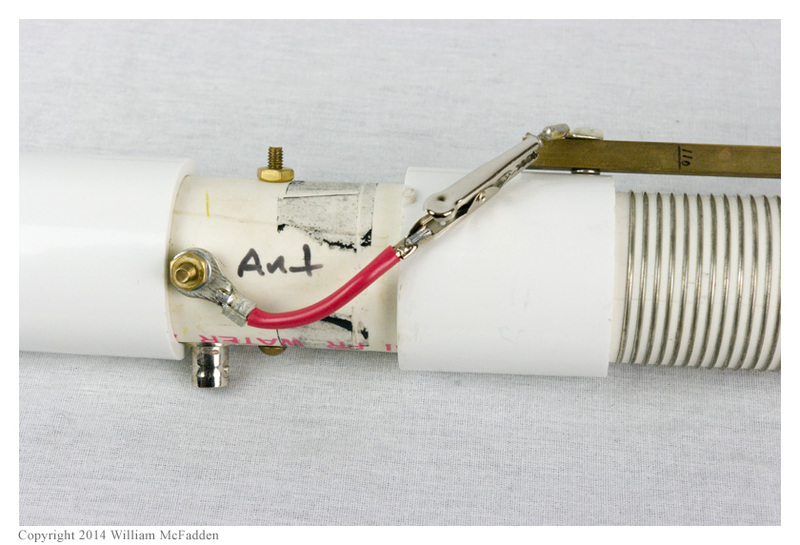 Because I began this quest to find an easy-to-deploy yet effective 80-10m field antenna while I was using an Index Labs QRP Plus, in places this page may still refer to my QRP Station in a Bag. The following descriptions are not necessarily presented in chronological order because my experiments antennas tend to overlap in time. Field Verticals | How to Get Wires into Trees? 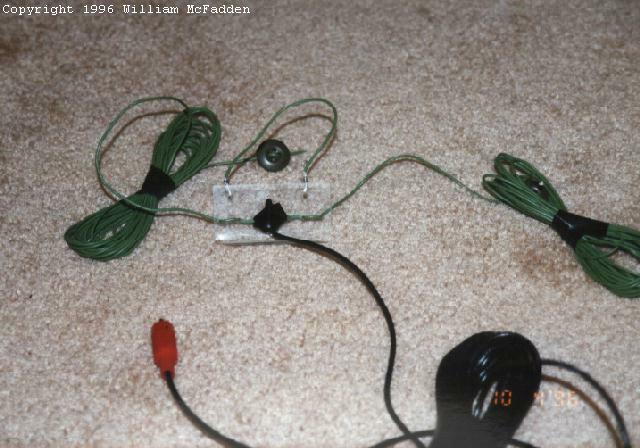 These dipoles were originally built for use with my first Heathkit HW-8. In my quest to find an easy-to-deploy all-band antenna, I have experimented extensively with the W3EDP wire antenna. 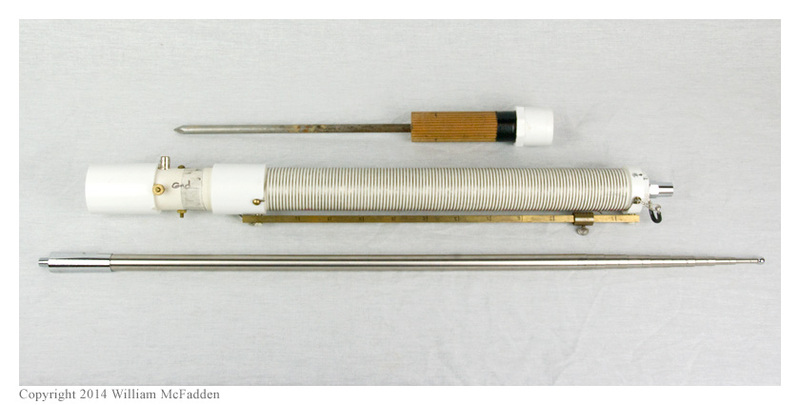 The W3EDP, a variation of a true Zepp, is an interesting antenna and was described in Practical Wire Antennas by John D. Heys, G3BDQ; additional information on the W3EDP can be found in my Archives and Articles; in the article The FFD Antenna: A Field-Friendly Doublet, with Notes on Related Designs by Charlie Lofgren, W6JJZ; and in the article W3EDP Antenna by Nick Toparcean, AE5VV. 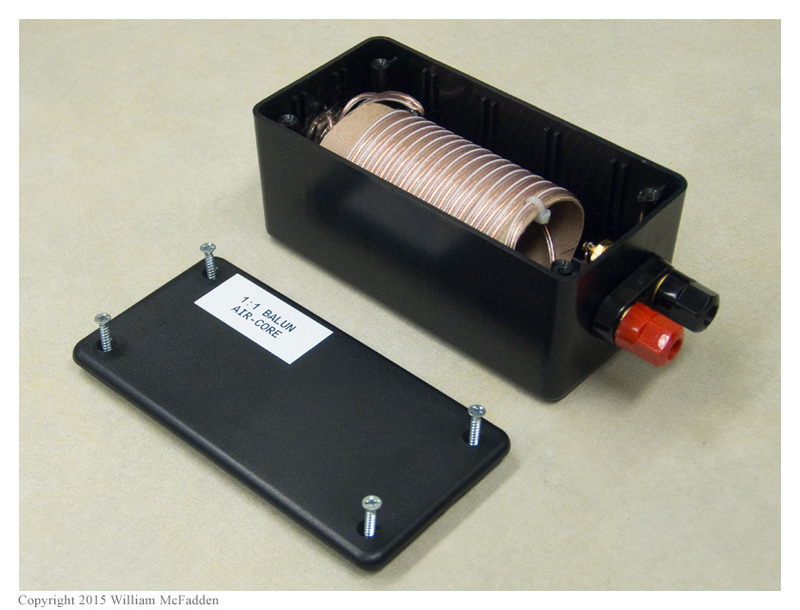 The W3EDP consists of an 85' wire and a 17' wire that's sometimes called a "counterpoise". The counterpoise isn't connected for 80m or for 10m, but is connected for 15m, 20m, and 40m. The W3EDP is very easy to deploy; it can be hung with only one elevated support, doesn't need a separate feedline, and packs up really small. My initial trials of the W3EDP were using an MFJ-901B antenna tuner and Heathkit HM-9 SWR bridge. I was able to successfully use the the W3EDP on 20m and 40m over the year that I experimented with it, on several operating events as well as on two trips away from home. Following the recommendations (article) of Charlie Lofgren, W6JJZ, I tried configuring my W3EDP such that the 17' wire was half of a parallel feedline, using 0.75" x 1.5" sheet styrene pieces as separators. However, when I tried this arrangement as an Inverted-L (using a sliding "button" insulator on the radiating element) from a cabin on Presque Isle, Michigan, I had trouble getting a good match on 20 and 80 meters. 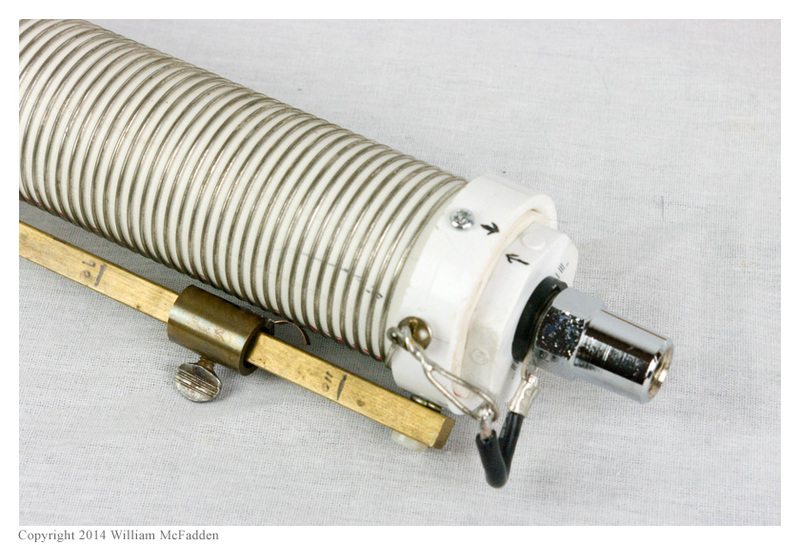 On subsequent trials with the 17' counterpoise lying on the ground it tuned easily on 20 and 40 meters, but I couldn't get a match on 80 meters. 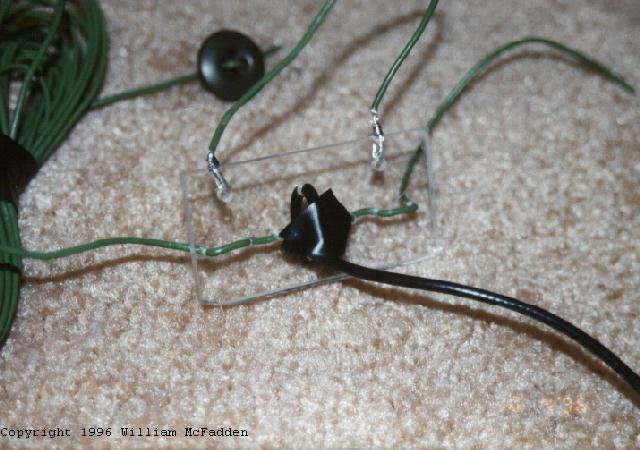 Clearly, the W3EDP/MFJ-901B antenna system was not the ideal all-band antenna system. The arrival of the LDG Z-11 QRP autotuner changed everything. The Z-11 easily tunes the W3EDP on 10, 15, 20, 40, and 80m through a homebrew 4:1 balun. I used this antenna from my billet at Rickenbacker Air National Guard Base (KLCK) during the month of June, 2003, suspending the 85' portion of the antenna between my third-floor window and the outside staircase of the neighboring building, allowing the 17' component to hang out the window. The tuner with balun easily tuned the antenna on all bands tried and QSOs were successfully made on 40m. 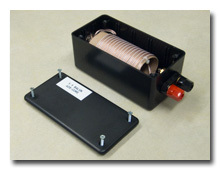 I have also used the W3EDP/Z-11/balun combination in the field. I operated the 2003 E-PA QRP "TAC" Contest with the W3EDP/Z-11 antenna system, this time with the 85' portion extended in an inverted-L arrangement between two trees and the 17' component lying on the ground beneath the radiator. Again, the tuner easily tuned the antenna on all the bands tested and QSOs were successfully made on 20m and 40m despite poor band conditions. The W3EDP/Z-11 antenna system is a viable all-band antenna system. It's easy to deploy, tunes easily, and covers all the bands of interest. 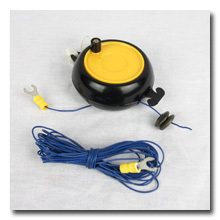 My current version of the W3EDP has the 85' end-fed wire wound onto an inexpensive plastic camping-style clothesline reel (photo). Following Charlie Lofgren's recommendation to keep the 17' wire off the ground to improve efficiency, I plan to make plexiglass feedline-insulators to enable me to easily configure the 17' wire as half of a parallel-feedline. UPDATE 1: I've retired the LDG Z11 QRP Autotuner in my K2 Travel Kit in favor of the K2's internal autotuner (KAT2). At the 2012 QRP ARCI Fall QSO Party at Mount Gilead	State Park I verified that the KAT2 will match the W3EDP on all bands, 10m through 80m, inclusive; for 40m, the KAT2's "ALT" mode was required to achieve a match on 40m. UPDATE 2: I used the W3EDP with the Elecraft KX3 and its built-in KXAT3 automatic tuner for the 2014 Arizona ScQRPions "Freeze Your B___ Off" contest. I verified the KXAT3 easily and quickly tunes the W3EDP with the 4:1 balun on all bands 10m through 80m, inclusive; the 17' counterpoise wire was left connected for all bands. I have built the KE4PT "Off Center End Fed Dipole for Portable Operation on 40 to 6 Meters" as described in March 2015 QST and Spring 2012 The QRP Quarterly (link), an antenna which I had hoped would be an easy-to-deploy, well-performing antenna. However, my first field test of this antenna during The 2015 Flight of the Bumblebees indicated this antenna doesn't perform as well on 20m or 40m as does a 28' end-fed wire. I will continue to test the KE4PT antenna. I will soon begin experimenting with End-Fed Half-Wave Antennas (EFHWA) as described by VK3IL (link). I have built the matching unit and will be testing it soon. Based on an article by VA3PCJ (link), in early 2018, I built a half-size version of the W3EDP, a W3EDP Jr, using speaker-wire	and inexpensive 300&ohm; TV-twinlead. I tested this antenna during Freeze Your B___ Off 2018 and found that when the W3EDP Jr was fed through a 4:1 balun, the KX3's internal ATU could quickly find matches on 10m, 12m, 17m, 30m, and 40m but it couldn't find a good match on 80m. I've since built a 4:1 unun for use with this antenna based on articles by IW7EHC (link) and WB3GCK (link). I took the W3EDP Jr to Florida to serve as a back-up antenna for a series of planned Parks on the Air activations. I deployed the W3EDP Jr at Lovers Key State Park, in close proximity to salt water, on my last full day in Florida, in the form of an inverted-L supported by the roof of a gazebo and a 20' Black Widow fishing pole, and fed through the new 4:1 unun. The W3EDP Jr in this arrangement worked very well netting numerous contacts on 20m, 30m, and 40m, and the KX3's internal ATU easily found good matches on these bands. Unfortunately, I neglected to test for a match on 80m at this activation. After reading the article Antennas and the QRP Operator by Jim Thompson, W4THU, in Low Power Communications, Volume 2 (edited by Rich Arland, K7YHA), I built a 20m Extended Double Zepp. This is an 86' foot doublet and is fed with balanced line. W4THU claims the 20m EDZ will provide 4dB gain over a 1/2-wave dipole on 20m, performance similar to a dipole cut for 40m and 80m on those bands, and useful gain over a dipole on 10m and 15m. I built my first version with lightweight hookup wire for the elements, using military buttons for the center and end insulators, and fed it with Radio Shack "Ultra Low Loss" 300Ω TV twinlead. During the 1998 QRP ARCI Fall QSO Party this antenna worked very well on 15, 20, and 40m, and also tuned easily on 10m and 80m. After the event, I "ruggedized" the EDZ with a 35mm film-canister center insulator. 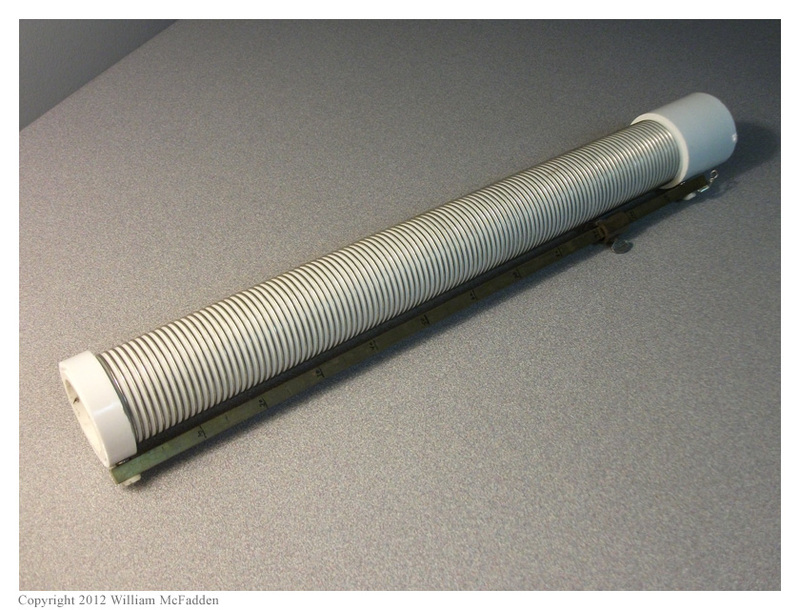 Ron Wiesen, WD8PNL, described a field-portable doublet antenna in this email to me. His doublet is made with clear-insulation speaker wire which his tests have shown to have very low loss when used as a feedline. Ron has reported good results with this flexible and inexpensive antenna. I had intended to build a doublet this type, using either ribbon-cable or zip-cord as the feedline and elements, but upon looking through my wire-box, I found that I didn't have a enough of either material on hand. 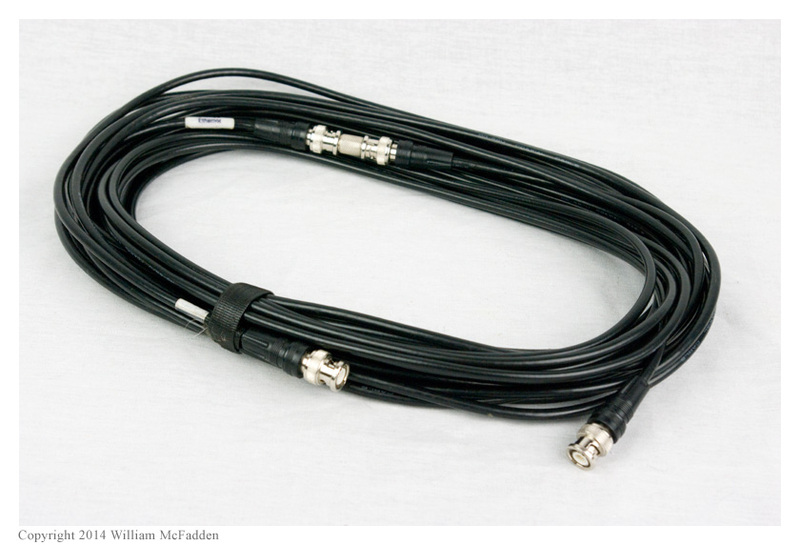 I did find, however, a marvelous military-surplus "Dipole Fixture" (#1540368) which included 30' of excellent low-loss 72Ω military twinlead, so I built a doublet using this 72Ω twinlead as the feedline, 22' pieces of ribbon-cable as the legs, a film canister for the center-insulator, a fishing-swivel to hang the thing, and military "BDU" buttons as end-insulators. 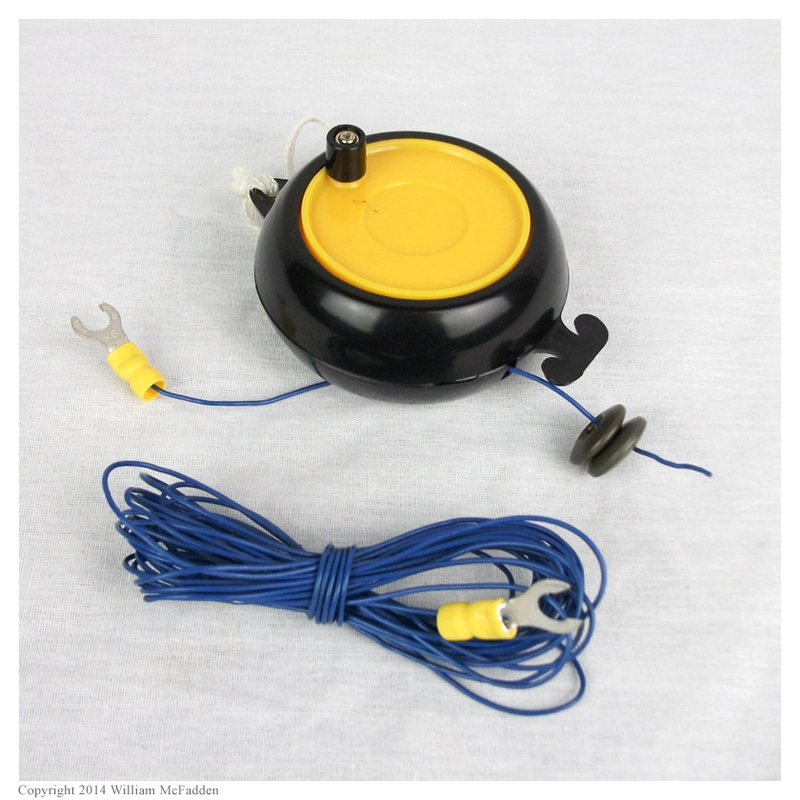 The "Dipole Fixture" itself was designed to serve as a center-insulator, center support, strain-relief, and wire reel for a doublet/dipole but is far too heavy to hang from a "Black Widow" 20' fiberglass fishing pole. 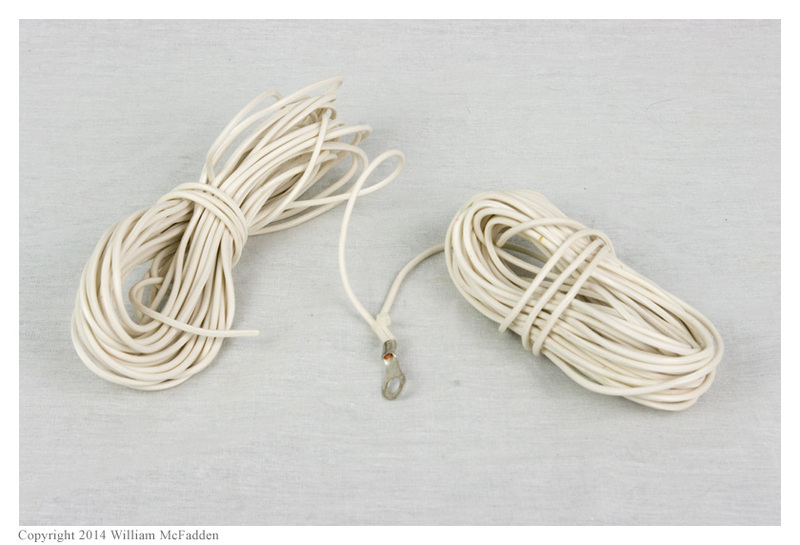 However, it serves beautifully as a tangle-free spool for transport of the doublet elements and feedline. I've erected this antenna, supporting it in the center with the Black Widow, and verified that the Z-11 will tune it on all the MF/HF bands. (I don't expect this 44' antenna to radiate well on 160m, but it seems the rig will be happy to pump RF into it!) 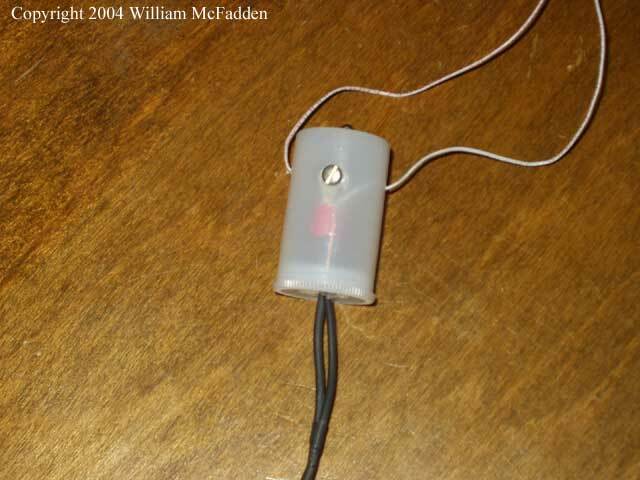 I used this antenna during the 2005 Freeze Your B___ Off contest. It worked very well on 20m and 40m. No activity was heard on 80m during this daytime contest, so I don't know yet how the doublet works on 80m. The Black Widow supports the doublet as an inverted-vee without problem, but there is significant bowing at the top of the pole. 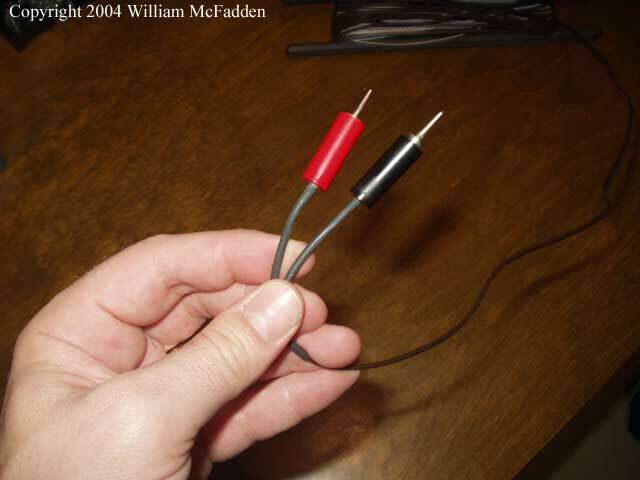 I am curious as to whether a NorCal Doublet (built with one continuous length of computer ribbon-cable and no center-insulator) would cause less bowing of the Black Widow. 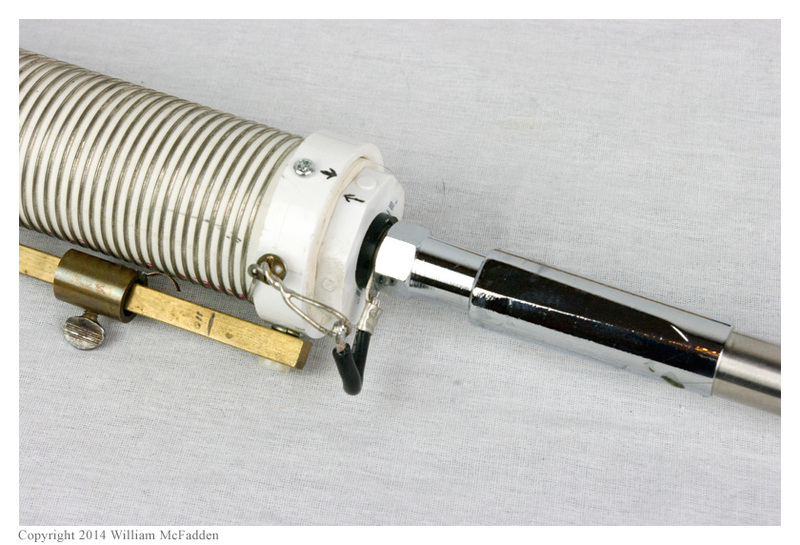 I also remain curious about the feedline-loss of antennas made of ribbon-cable. Eventually, I hope to run some tests on ribbon cable as a feedline and possibly make a NorCal Doublet to test. 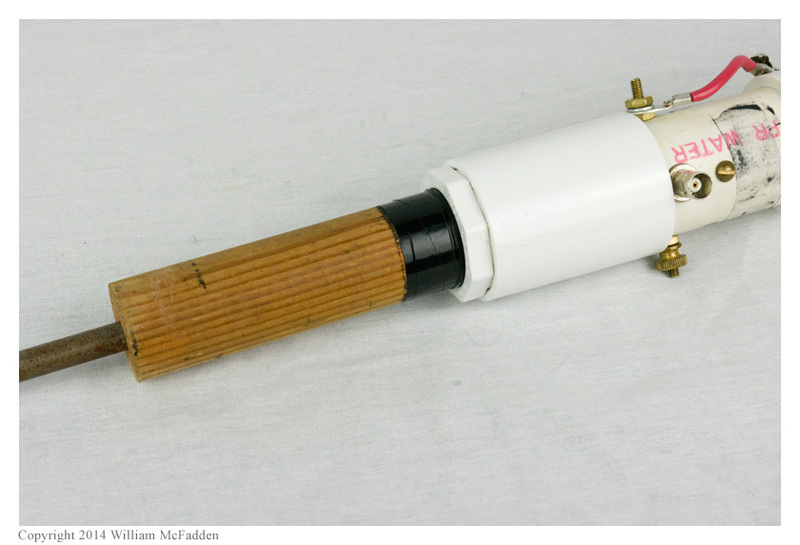 In the meantime, the doublet, as constructed, remains a viable field-portable antenna. For improved performance on 80m, I made a lightweight 88' doublet to be supported by the 33' MFJ-1910 mast; it is constructed of 24AWG speaker wire and light-duty 300Ω TV-type twinlead, a film-canister center-insulator, and military "BDU" button end-insulators. Myron Schaffer, WV0H, has performed an interesting and insightful Smith Chart analysis of the 88' doublet (link). I tested my 88' doublet during the 2010 Arizona ScQRPions "Freeze Your B___ Off" event and found that the LDG Z-11 matched the 88' doublet easily on 20 and 40m but the best the Z-11 could do on 80m was about 2.5:1. This antenna worked well during the 2010 ARCI Fall QSO Party, and it even allowed me to make a two-way QRP QSO with Hawaii on 15m, a band it's not supposed to work well on. As during the previous event, the best match I could achieve on 80m was about 2.5:1. It's likely a slightly different feedline length would allow a better match on 80m. UPDATE 1: After using the 88' doublet suspended as an inverted-vee on the 33' mast for the 2011 Arizona ScQRPions "Freeze Your B___ Off" event I have begun to re-think this antenna's usefulness. Propogation was very poor the day of this event and very few stations were heard on 20m. In fact, I heard only three FYBO stations on 20m, and all were located in Florida. I later learned that K8RAT, just 150 miles or so north of me, heard many stations on 20m with his 98' doublet suspended horizontally at 40' and worked FYBO stations all over the country on 20m. I have verified that the 88' doublet is neither open nor shorted at the center insulator, the feedline and legs aren't open, and the balun is properly constructed and performing as it should. I am left with the conclusion that either the doublet is too directive on 20m--it's effectively an Extended Double Zepp on 20m--or that it was close enough to the ground when supported as inverted-vee from the 33' mast that the take-off angle was high enough I simply wasn't able to hear most of the stations on the band. The problem may be, in fact, a combination of both of these. UPDATE 2: I used the 88' doublet suspended as an inverted-vee on the 33' mast the week of July 11, 2011 while in Lexington, Kentucky. The primary goal was to make daily contacts with K8RAT in north-central Ohio on 80m and, as such, the low height of this antenna would be expected to provide good NVIS performance, and it did. However, even with an unmeasured length of 300Ω twinlead added to the feedline to reach the operating position the LDG Z-11 could not achieve a match of better than about 2:1. Despite the high SWR, daily contacts were made with K8RAT although 9-watts was the most the K2 would generate without complaining. The Z-11 easily matched this antenna on 15, 20, and 40m although no operating occurred on these bands. UPDATE 4: I've retired the LDG Z11 QRP Autotuner in my K2 Travel Kit in favor of the K2's internal autotuner (KAT2). At the 2012 QRP ARCI Fall QSO Party at Mount Gilead	State Park I verified that the KAT2 can match the 44' doublet with 60' of 72Ω feedline on all bands 10m through 80m, inclusive. 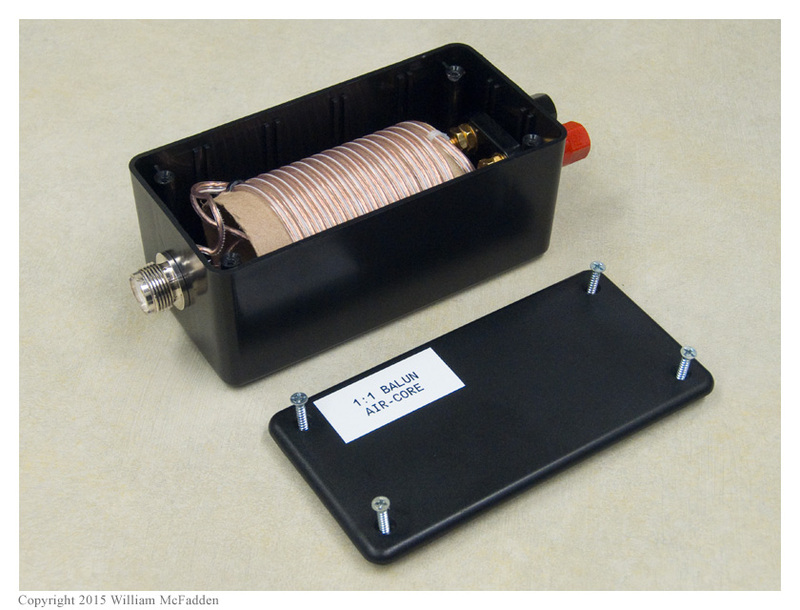 UPDATE 2015-06-07: I finally constructed a 44' doublet and a 1:1 air-core balun (photos: 1 | 2) from 22-gauge speaker-wire as suggested by Ron Wiesen, WD8PNL, over a decade ago. (See above.) 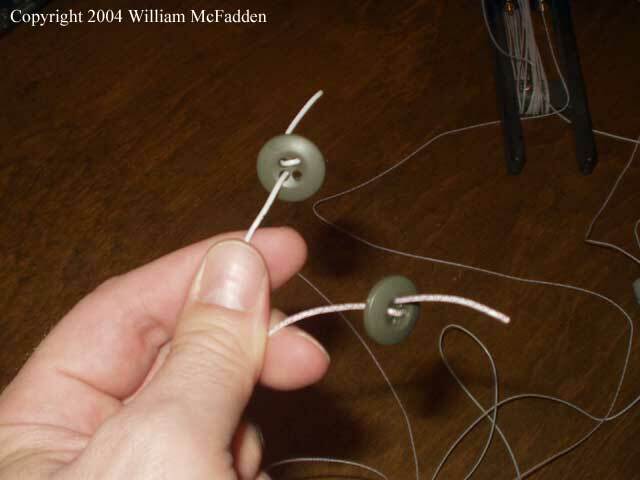 Instead of tying a knot at the doublet's center, I used a button as a strain-relief/center-insulator. As with my other field antennas, military "BDU" buttons serve as end-insulators. The overall length of the antenna is 76' (22' for each doublet leg plus 54' of feedline) so this antenna should be easy to tune on 10, 15, 20, and 40m. The benefit of this antenna over my existing 44' doublet fed with military 72Ω twinlead is that this antenna is made of continuous lengths of wire with no solder-joints to fail. I built the 80-10m version of the W6MMA Vertical using a 20' Black Widow telescoping fiberglass crappy pole from Cabelas and Vern Wright's nicely-machined 80m coil kit (photo). I had very high hopes for this 80-10m no-tuner-needed self-supporting vertical antenna. The W6MMA has proven to be very easy to deploy, and requires no supporting mast or tree. I successfully used this antenna in the 1999 E-PA "TAC", the 2000 FYBO, and the 2000 ARRL Field Day. Initially I used radials made from computer ribbon cable. These ribbon cables store very well and are relatively tangle-free but are fragile. I've since replaced these with radials made from split #18 zip cord--white for easy visibility--and have found these to be flexible enough that tangling hasn't (yet) been a problem. The only real problem with this antenna is that adjusting it after band changes seems to require two people--one to key the rig and read the SWR bridge, and one to adjust the sliding tap. If I owned an antenna analyzer this wouldn't be so much of a problem. UPDATE: I acquired an MFJ-249 Antenna Analyzer from the estate of WA8DYD at the Athens Hamfest (April 28, 2013); I plan to start using the W6MMA more often now. Immediately upon learning of it, I was very intrigued by the MFJ-2286 "Big Stick" (~$100, link) 40m-6m 17' stainless-steel telescoping portable vertical. This vertical would provide all of the utility of the W6MMA Vertical except for coverage of 80m but would be much lighter and would pack into a much smaller package. The MFJ-2286 would be much easier to carry than the W6MMA Vertical on human-powered-transport field operations with my KX3 Travel Kit. In the spring of 2018, I built the N2CX-inspired tri-band field vertical offered by QRP Guys (info). 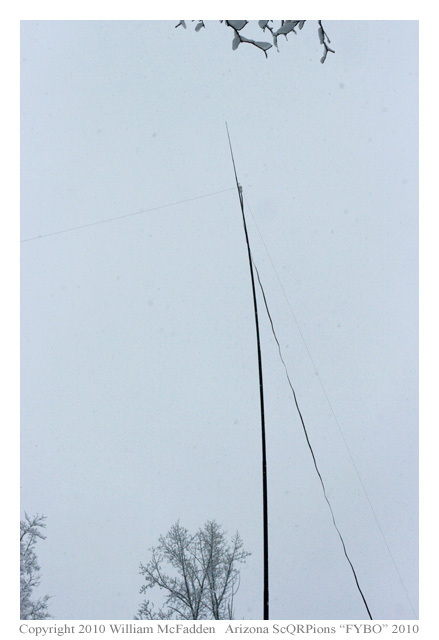 This antenna, which is 17' tall and is easily supported by my 20' Black Widow fishing pole, covers the 20m, 30m, and 40m bands without the need for an antenna tuner. 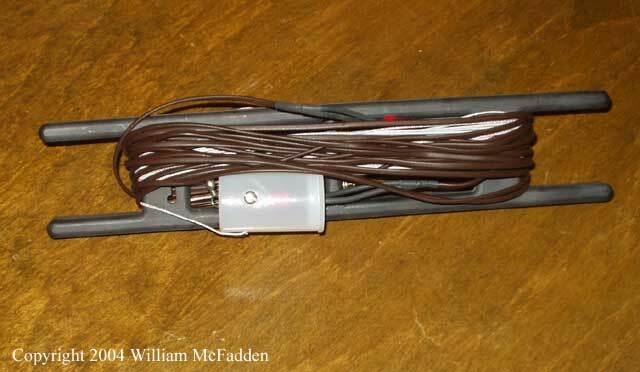 The N2CX-inspired tri-bander, a 20' Black Widow pole, four 10' counterpoise wires, and a 25' length of RG-58 was to be my primary antenna for a series of Parks on the Air activations in Florida in the Fall of 2018. Although the antenna measured well in Ohio, at early activations in Florida the SWR was high on 40m and at later activations it was high on both 20m and 40m. While in Florida, I played with the length of the radiator but, not having an antenna analyzer available, I wasn't able to improve the match on either band much. Back in Ohio, I was able to use my antenna analyzer to restore the radiator to a length that provided a good macth on 20m and this length also produced acceptable matches on 30m and 40m. What changed with the antenna while I was in Florida? I first suspected dirty slide switches but I was unable to confirm this, and if this was the problem, the switches magically cleaned themselves when I got back to Ohio. I've since begun to wonder if the real culprit was the difference in ground-conductivity between the lousy clay in southeastern Ohio and the sand and high water-table in Florida. More tests will be performed with the N2CX tri-band antenna. How to Get Wire into Trees? I have had a really difficult time getting string and wire into trees. I've tried using small lead weights and weighted tennis balls, but I've been most successful with half-full disposable water bottles. 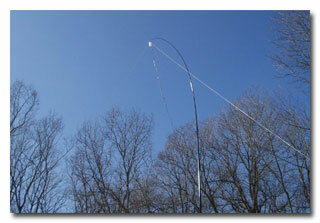 Tom, W4UUC, sent me an email describing his use of a fishing rod and reel to throw a line over a tree. He is able to throw an appropriately-weighted fishing line over trees taller than 70', and uses the fishing line to pull paracord over the tree to support his antenna. In his opinion, a rod-and-reel is much better than a slingshot.